To answer your question straight out, the best time to hike Machu Picchu, in our opinion, is on the shoulder months of the dry season, Late April / Early May and Late September / Early October. At these times the trails tend to be significantly quieter than peak season, the Citadel less packed and the weather conditions relatively good. If you are not too bothered about crowded trails, busy hotels and the tourist hordes that visit Machu Picchu by train from Cusco each day then the best time to hike Machu Picchu is during the dry and peak season which runs from May through to September. 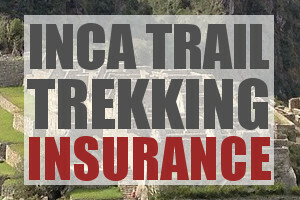 If you decide to go during the peak season you will need to book early if you want to grab one of the 500 permits available on the Inca Trail each day (note: about half are taken by guides and porters). Alternatively you could trek on the less popular (yet equally authentic trails) of Salkantay, Lares or Vilcabamba, but be prepared for a more challenging hike – see trail and route options here. The wet season begins in November and gets into full swing over the months of December, January and February. The Inca Trail is closed every year in February for restoration. We do not recommend trekking Machu Picchu in these months, although if you plan to catch a train from Cusco you can get lucky with the weather and have a lovely day in Machu Picchu. November and March are risky months for trekking (not for visiting Machu Picchu by train) but it is still possible to encounter limited rain. The upside of these months is that you will have the trail largely to yourself. In this article we provide useful historical weather charts on temperature, rainfall and wind. You will notice that like most of the sub-tropics in the Andes, there are only two season – dry (May-September) and wet (November-April), and that temperature are moderate during the day and cold at night. Please use the quicklinks to jump between sections. Below you can see the average high and low temperatures for Machu Picchu. You will notice that temperatures are relatively consistent throughout the year, this is a common feature in the sub-tropics. The maximum highs and lows can fluctuate though, as you can see on the chart. It is worth noting that temperatures are usually moderate to warm during the day at Machu Picchu, but drop relatively rapidly in the evening, and can go below zero at night time. 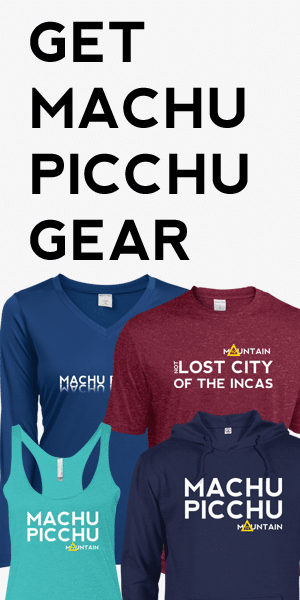 For this reason it is important to bring layered clothing throughout the year (here are equipment packing list requirements for Machu Picchu). 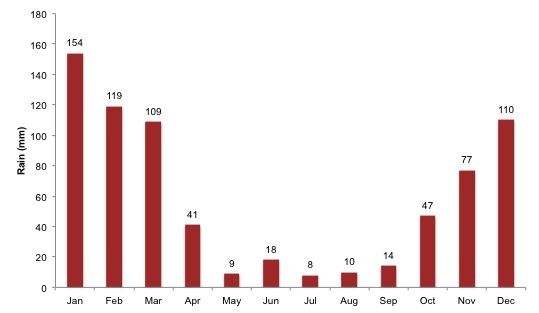 The rain chart shows average monthly rainfall in Machu Picchu. You can clearly see the two distinct seasons. The dry months run from late April through to early October, and the wet months from late October through to early April. The best time to hike Machu Picchu if you are trying to avoid rain is May through September. This is of course the busiest time as well. There is a possibility of encountering some rain, or drizzle, at any time in the year. 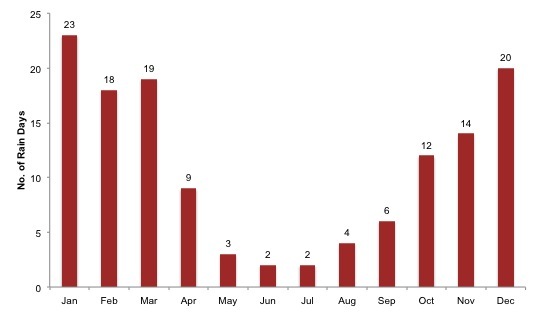 The chart below shows the average number of rain / drizzle days by month. Unsurprisingly the trend matches the average precipitation by volume chart shown above. 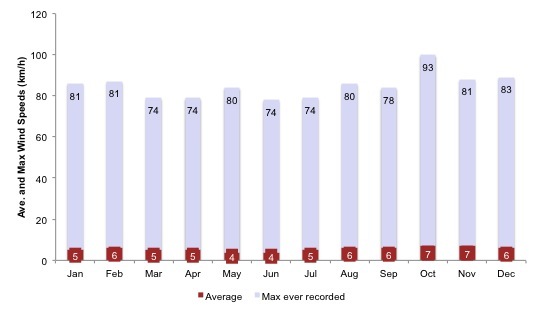 The chart below shows average monthly wind speeds (km/h) in Machu Picchu. 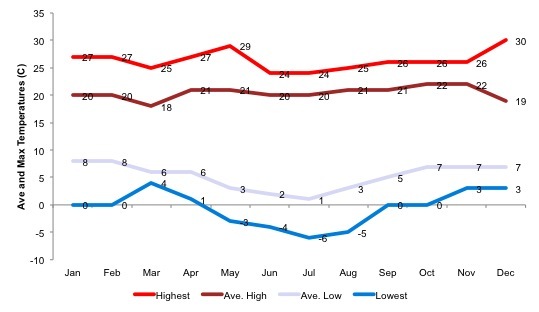 As you can see the average is relatively low and consistent. The light grey bars show the maximum winds speeds ever recorded in Machu Picchu. Receive a price competitive quote from our trusted on-the-ground operator.